When it comes to designing your fitted bedroom, at KBB Designs we offer a convenient and fully integrated service, from design through to completion. We are experts at maximising space to deliver beautiful made to measure fitted furniture which provides ample storage for the perfect bedroom, study or lounge. As with our fitted kitchen and designer bathroom service our expert service is on hand at every stage. Flexibility is the signature of our made to measure furniture, all is made to order and a very high standard, which allows us a huge range of available units. Special sizes can be made to deal with even the most difficult situation, from classic and traditional through timeless Shaker styles and into more modern and contemporary options. we manufacture all interiors to your precise preferences. During our consultation we will also gain an insight into your vision for your new fitted bedroom or study – this allows us to create the perfect design for your lifestyle and home. Made to order, and to a very high standard, our range of fitted bedroom, traditional and sliding doors furniture covers different sizes as well as a huge choice of colours, finishes and styles. 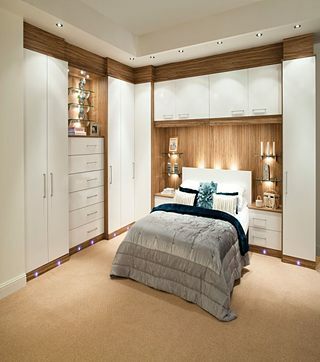 To complete your fully fitted bedroom we have an extensive range of internal fittings and lighting options. KBB Designs will present a detailed 3D CAD (computer aided design) design to enable you to visualise the full potential of your new bedroom, study or lounge.